Sedum repestre ‘Angelina’, commonly known as Stonecrop, is a low-growing and mat-forming plant for garden borders and rock gardens. 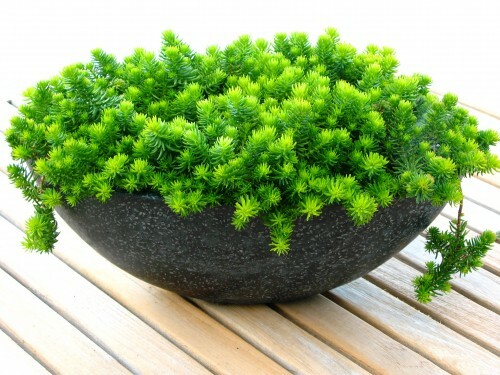 The plant grows up to 4 inches tall but spreads across 2 feet thus making a nice ground cover. Sedum repestre ‘Angelina’ is characterized by golden-yellow foliage and star-shaped summer flowers. It is propagated by cuttings and divisions. Sedum repestre ‘Angelina’ is not fussy about growing conditions and thrives well in a well-drained soil under full or partial sun. As a hardy and drought-tolerant plant, Sedum repestre ‘Angelina’ can be used to fill empty garden spaces in garden. When grown in containers, it grows as a nice accent plant with cascading habits.